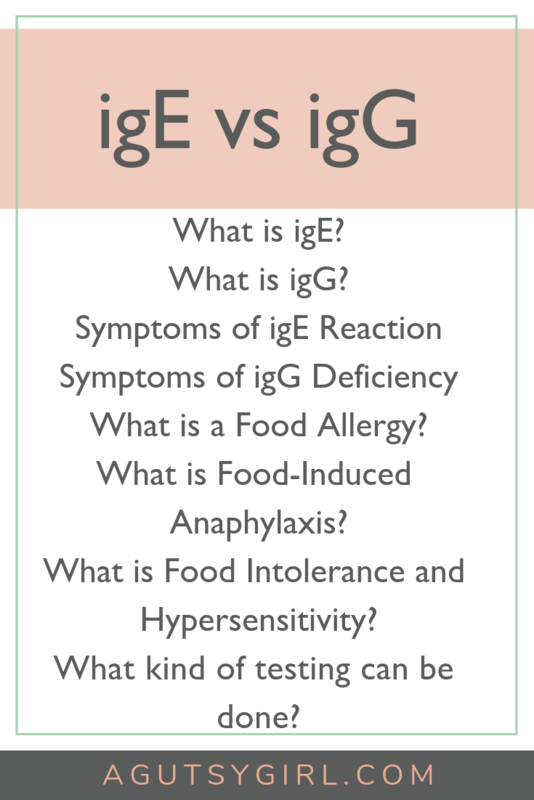 Starting with igE vs igG, we could get super detailed and medical. I could go into all the nooks and crannies, likely far more than will ever truly be helpful for you. But I won’t because of just that, I want to be truly helpful, so my goal here is to keep the information simple and digestible (pun intended – yes). 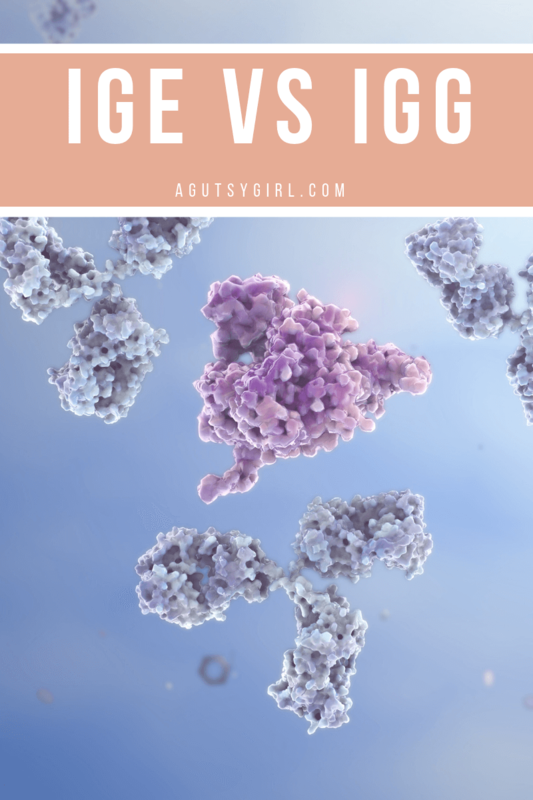 The “Ig” stands for Immunoglobulins, and there are five major kinds of immunoglobulins: A, D, E, G and M. They are special proteins produced by the body in response to foreign substances including bacteria and viruses. A: One of the most common; it is mainly present in body secretions and is the chief antibody in the mucous membranes of the gastrointestinal and respiratory tract and in saliva and tears. D: Is present in small amounts in serum and is thought to function in certain allergic responses. M: Is a large molecule; found in blood and is involved in combating blood infections. It is the first or primary immunoglobulin produced following exposure to an antigen. 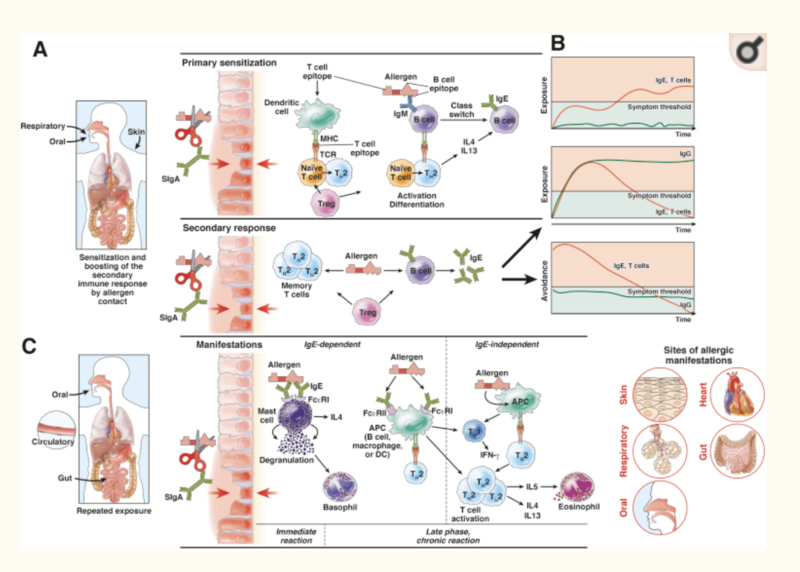 igE stands for Immunoglobulin E and they are antibodies produced in the immune system. 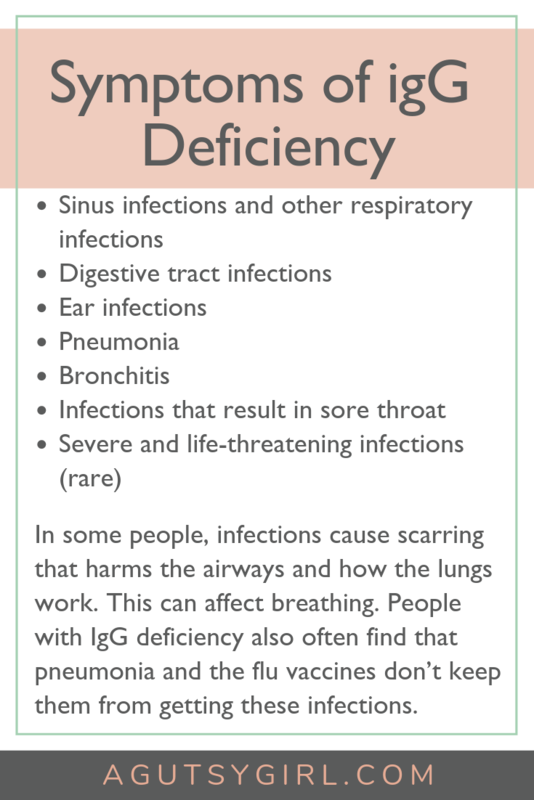 igG stands for Immunoglobulin G and it is the most common type of antibody found in blood circulation. It may or may not cause an anaphylactic reaction. A food intolerance and hypersensitivity will not trigger an allergic reaction. This is where the majority of the Gutsy community falls. And while it’s not life-threatening, it’s frustrating because a food intolerance takes longer to show up usually. Thus, people tend to spin their wheels for years trying to figure out what’s wrong. There are many different ways to go about testing, depending on your signs and symptoms. 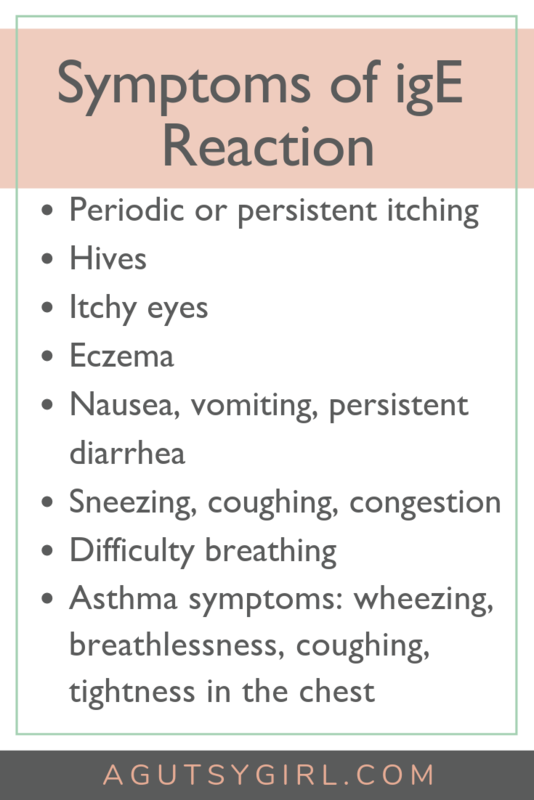 If you feel it’s an allergic and/or anaphylactic reaction, head to the doctor immediately. 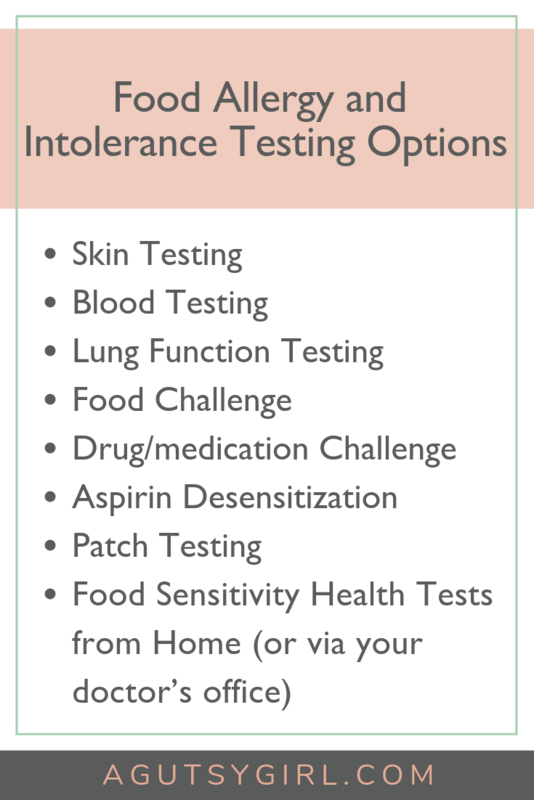 I have done: skin testing, blood testing, food challenges, and food sensitivity testing. While igE vs igG are different, they both pose many problems and are a beast to deal with in the Gutsy community. p.s. This is just scratching the surface of topics and issues relating to all of the above. If you have specific questions around any of them, please CONTACT ME so that I can do follow-up, detailed posts. Hi! Thanks for sharing. I don’t know much about Prostoglandin D2, sorry. I’ll be thinking of you.